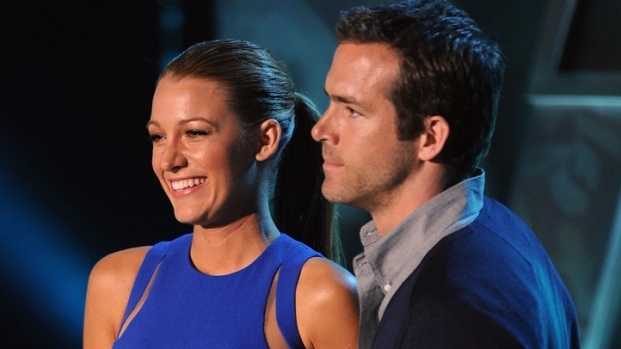 For Blake Lively, “Green Lantern’s” real power lies in the woman behind the superhero. “I grew up watching comic book movies like this and I never saw a woman who was equal to the man,” says the 23-year-old actress, who plays Carol Ferris, the longtime love interest – and boss – of Hal Jordan (Ryan Reynolds). Ryan Renolds and Blake Lively on "Green Lantern"
Ryan Reynolds and Blake Lively chat about "Green Lantern." What fears did they have to overcome to shoot the film? Another selling for the female audience? “Ryan is half naked," jokes Lively. And if the willful Lively has her way, Carol Ferris will be back in a sequel, exploring her dark side – as fans of the comic book lore know, she occasionally morphs into the sultry, scantily-clad and sinister Star Sapphire (think Serena van der Woodsen with a purple power stone, a barely there magenta super-suit and a very bad attitude). “I loved that if this franchise continued that she does become a villain!” says Lively.